In my usual working day I wake up thanks to the alarm in my iPhone, I fire up the iPad to read the daily newspapers, look at the email while having breakfast and then jump into the car to commute to the office; during the day I use Twitter when out for lunch, and also upload some photos while on the go to share them with my peers. And when I upload my shots to Flickr — I love the geotagging feature (which is on by default on my iPhone). Shall I continue? I’m sure that since you’re here to read a technology blog, what I’m saying shouldn’t sound too new to you. Now let me tell you a different story. 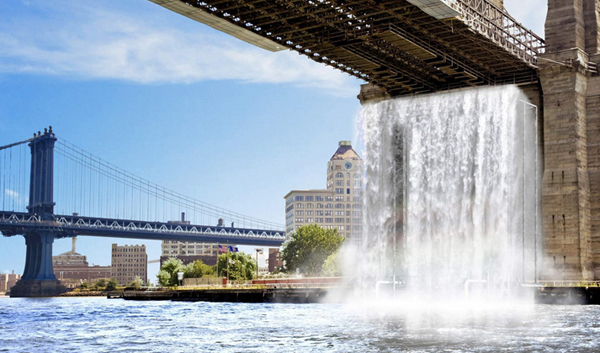 In 2008 the City of NY decided to invest more than 15M dollars in the creation of 4 giant waterfalls, created using giant man made scaffolds, in the waterfront of the city with the aim to attract tourists and New Yorkers, contribute to promote the role of the city as the World Capital of Culture and generate new business for local economy. Now since Mr. Bloomberg was the one paying those 15 M bucks he wanted to know the ROI of the investment. Where the people were going to watch the 4 different waterfalls? Which vantage point were they choosing? But how can you ever quantify something as intangible as people behaviours in open spaces? Now let me introduce you to Andrea Vaccari, a young talented Italian researcher who spent the last few years at the Boston MIT’s Senseable City Love and that I recently met at the Frontiers of Interactionconference in Rome (note to the reader: I’m the organizer of the conference) where he spoke about a project to track tourists movement in Italy clustering them by Italian and foreign tourists. His team tracked tourists’ movements by analyzing geotagged photos on Flickr so to create a path for each visitor. The results? Foreign tourists usually travel to major cities such as Milan, Florence, Venice or Rome while Italian tourists, who are supposed to have a better knowledge of their country, prefer visiting smaller cities out of the main touristic paths. What Bloomberg did was contacting the Senseable City Lab asking them to find a way to measure people movements in NY and what Andrea and his team did was to push the touristic path experiment even further: they tracked the cellphones activities in NY and measured the fact that cellphone activities in waterfront places outperformed in 2008 the activities during 2007 for the same places. For ages it’s been pretty impossible to track people behaviours in open spaces. Now we have the (mostly) off-the-shelf technology to learn of how we behave and plan accordingly. Let’s go out and play with those data, this is the digital sociology era. Digital breadcrumbs of our lives. This entry was posted in Beef and tagged foi10, footprints, frog design, frontiers10 by admin. Bookmark the permalink.